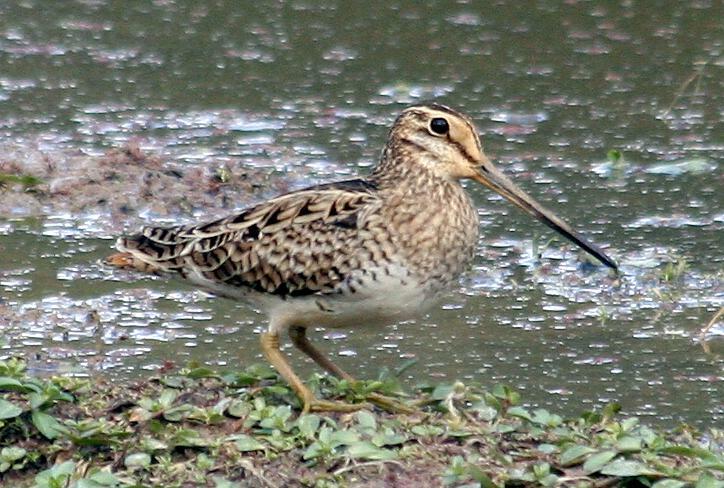 Latham's snipe, Gallinago hardwickii, also known as the Japanese snipe, is a medium-sized, long-billed, migratory snipe of the East Asian–Australasian Flyway. It is identifiable as a Gallinago snipe by its cryptically-patterned black, brown, buff and white plumage, but is not easily distinguished from Swinhoe's snipe and pin-tailed snipe in the field, though it is slightly larger. Order:	Charadriiformes, Suborder:	Scolopaci, Family:	Scolopacidae, Genus:	Gallinago, Species:	Gallinago hardwickii (J.E.Gray, 1831). Taxonomy: Scolopax Hardwickii J. E. Gray, 1831, Tasmania. E Primorskiy, S Sakhalin and S Kuril Is S to Hokkaido and N & C Honshu, and possibly Kyushu (S Japan). Winters in E Australia and Tasmania; perhaps also small numbers in New Guinea.